Bring a fresh, traditional look into your bathroom with this vanity. The white marble counter and grey solid wood base make this piece great for any bathroom. Make your bathroom look like new with this good-looking, useful set from Avanity. For some added traditional style in your bathroom, choose this beautiful vanity. The brown marble counter and grey plywood base make this piece great for any bathroom. With drawer and double-door cabinet, this vanity set is also great to keep items in. Add a classic feel to your bathroom with this simple vanity set from Bellaterra. Add the warmth and elegance of natural wood to your bathroom, with the Naples 36 inch Vanity and 37 inch Tempest Black natural stone vanity top with pre-attached rectangular under-mount vitreous china bowl. Treated with an Antique Walnut finish, this furniture-style vanity cabinet features 2 doors and 3 drawers that offer ample storage space. The cabinet's full-extension drawer glides provide smooth opening and closing and its maple interior is coated with PVC for easy cleaning. The cabinet features black birdcage-style door handles for a decorative touch. Modero 37-inch W Freestanding Vanity in Grey With Marble Top in White Bring a fresh, traditional look into your bathroom with this vanity. 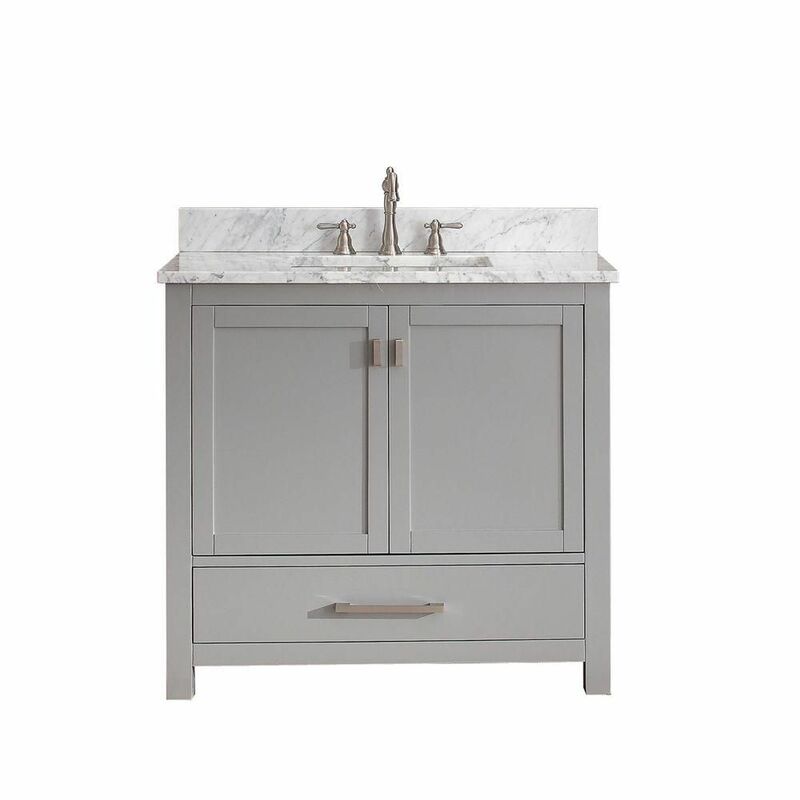 The white marble counter and grey solid wood base make this piece great for any bathroom. Make your bathroom look like new with this good-looking, useful set from Avanity.